A common Hong Kong Wi-Fi brand, Wi-Fi.HK, was launched on 5th August 2014 which enables the public and visitors to easily identify free Wi-Fi hotspots throughout the territory. 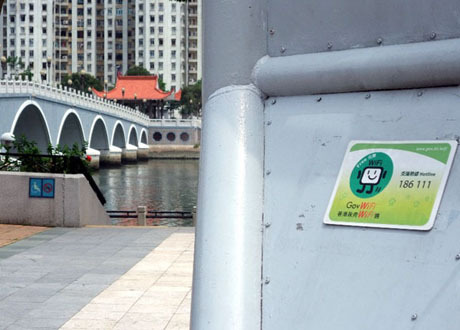 Locals and visitors can connect to free Wi-Fi if they can access Wi-Fi hotspots under the brand Wi-Fi.HK with smartphones or mobile devices, or at places with the Wi-Fi.HK signage. 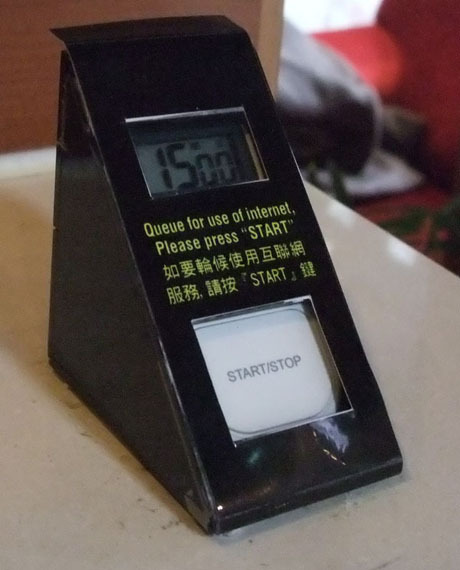 The Wi-Fi service provided is either completely free or free for at least 30 minutes. No registration is required. To date, participating organisations of the Wi-Fi.HK brand include Hong Kong Telecommunications (HKT) Limited, Hong Kong Broadband Network Limited, Hutchison Global Communications Limited, Y5ZONE Limited, Airport Authority Hong Kong, the Hong Kong Science and Technology Parks Corporation and Hong Kong Cyberport Management Company Limited. At November 2015 over 17,000 hotspots were available under the Wi-Fi.HK brand, including Wi-Fi hotspots under the Government Wi-Fi Programme (GovWiFi). Wi-Fi.HK provides free Wi-Fi service across the city covering Hong Kong International Airport, tourist attractions, public telephone booths, shopping centres, cafés, restaurants, convenience stores, Cyberport, the Science Park and GovWiFi premises. In January 2016 the government announced its intention to double the number of hotspots available under the Wi-Fi.HK brand to 34,000 within three years and progressively double the overall Wi-Fi connection speed. At government premises with high patronage, including all public libraries, the connection speed for each user has been increased from 1-2 Mbps to 4 Mbps. The public and visitors can use the Wi-Fi.HK mobile app and the positioning function of their mobile devices to locate free public Wi-Fi hotspots in their vicinity, or they can use the app to search for hotspots by district, venue type or keyword. 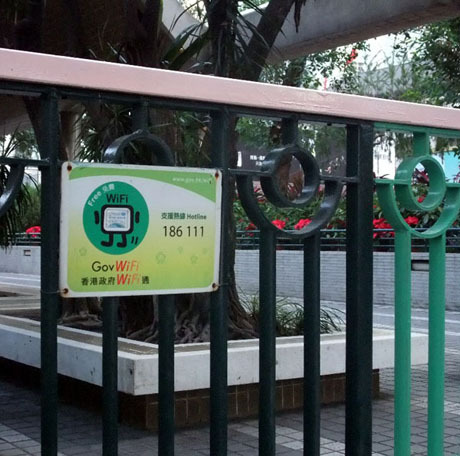 The Hong Kong Government GovWiFi scheme provides free wireless internet access via over 3,000 hotspots at about 570 locations (at December 2015) throughout public spaces in the city including public libraries, cultural and recreational centres, museums, sports venues, cooked food markets and major parks. The facility is available for foreign visitors to use. The scheme does not extend to private or commercial buildings and is not on the same scale as some free city wide wi-fi schemes already in operation in Taipei and Singapore. The scheme, which was launched in March 2008, initially covered 35 locations was rolled out in phases with 390 hotspots being available by March 2010, a further 2000 hotspots available by March 2012 and, following a HK$12 million further investment programme, the network has reached its current level. Following expiry of the service contract for the initial programme, Next Generation Government Wi-Fi (GovWiFi) was launched on 21st December 2012, under a five year contract until the end of 2017. The new programme provides several enhancements including adoption of Wi-Fi technology standard (IEEE 802.11n), which provides better signal coverage, enables faster data transfer and reduces signal interference and support for the latest Internet communication protocol (IPv6) for accessing web sites and Internet services delivered through IPv6. The average connection speed has increased from 1 to 2 Mbps to 3 Mbps for general internet use such as web browsing and sending e-mail. No registration is required and there is 120-minute connection time limit and 15-minute idle time limit. Users can reconnect to continue the service after reaching these limits. Hotspots are located mainly in public libraries, government premises, public parks and tourist locations. Tourist locations with hotspots include Peak Road Garden, The Peak, Kowloon Park, Repulse Bay Beach, Hong Kong Cultural Centre Piazza/Tsim Sha Tsui Promenade, Hong Kong Park, Hong Kong Zoological & Botanical Gardens, Statue Square, Stanley Waterfront Mart/Promenade, Hong Kong Macau Ferry Terminal, China Ferry Terminal, Golden Bauhinia Square, Wan Chai Temporary Promenade, Southorn Playground, Kwun Tong Promenade and Kai Tak Cruise Terminal. Since its launch, the monthly average number users of the service has increased from 20,000 to about 700,000. During the year ended October 2015 the location registering the most connections was Hong Kong Central Library and Stanley Community Hall registered the lowest number of connections. The Office of Telecommunications Authority is also making provision for broadband wireless access via Wi-Max, a much more powerful version of Wi-Fi where a single transmission tower can provide wireless Internet up to 48km away. Licences were due to be auctioned in autumn 2008 with services rolled out during the following two years although as at April 2012 no Wi-Max services were available and it appeared little progress had been mad. 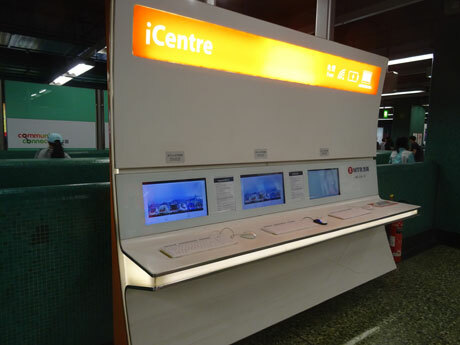 MTR iCentre, Sham Shui Po Station, one of 14 stations offering free wi-fi service. Since 8th July 2013, free wi-fi hotspots are available in the paid area of all MTR stations but not on platforms or trains except Airport Express trains. 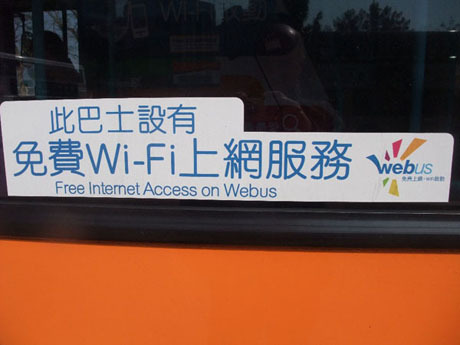 Free Internet access is available on all Airport Express trains. The service is provided by PCCW-HKT Limited. Power charging sockets are available in cars 1 and 7 of Airport Express trains. 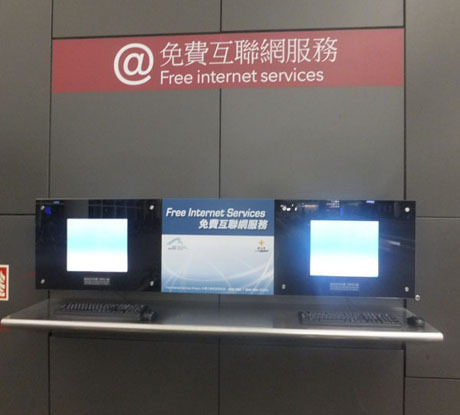 All Airport Express Stations (Hong Kong, Kowloon, Airport, Tsing Yi & Asia World-Expo) have free Wi-Fi access in paid areas of the station and on concourses but not on trains. 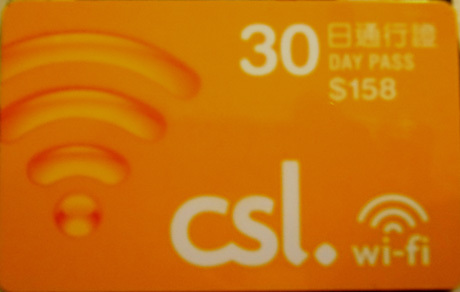 PCCW Wi-Fi (subscription) is available on trains and platforms. Pacific Coffee have 50 shops throughout Hong Kong (including two at the airport) which have Internet terminals for customers use free of charge. The number of terminals at each shop varies from one to about six. There is no time limit unless all terminals are occupied in which case customers are requested to limit use to 15 minutes if others are waiting and a 15-minute timer is located next to each terminal which can be set by waiting customers. PCCW wi-fi internet access is also available at Pacific Coffee but is not free to use. STARBUCKS COFFEE SHOPS - 30 min free session provided by CSL Wi-Fi service. Activation code printed on till receipt. 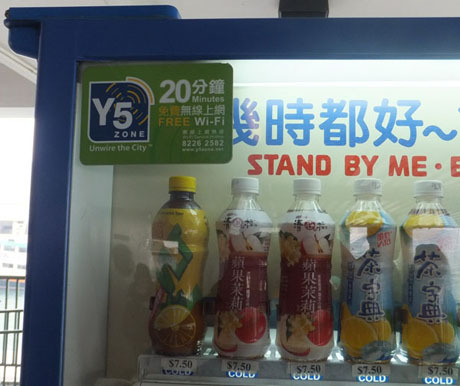 Y5Zone/HKBN provides limited free wi-fi access for McDonalds, McCafe, Pret a Manger, UA Cinemas, Wilson Parking and at a number of Vitasoy drinks vending machines. 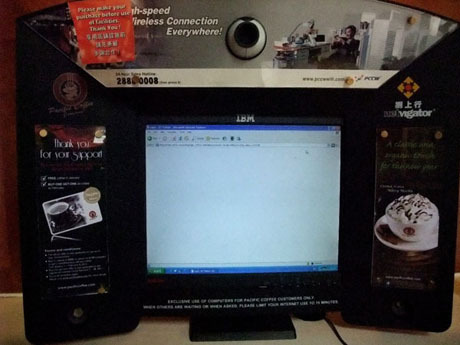 Unlimited free wi-fi access is available at a small number of McDonalds branches such as Internet access is not usually available some small outlets such as kiosks. To take advantage of free wi-fi it is necessary to complete a short simple (three or four question) online questionnaire. After the free period has expired, further access can be gained at a charge of HK$5 per hour by sending SMS text to Y5Zone/HKBN for user name and password. IFC MALL (Central District), THE ONE (Tsim Sha Tsui), EAST POINT CITY (Tseung Kwan O), GRAND CENTURY PLACE (Mongkok), HARBOUR CENTRE (Wan Chai), METROPLAZA (Kwai Chung) , NEW TOWN PLAZA (Sha Tin), WORLD TRADE CENTRE (Causeway Bay), FIRST FERRY CENTRAL PIERS 5 &6 AND CHEUNG CHAU AND MUI WO FERRY PIERS. Customers can also subscribe to available paid wi-fi networks at these outlets and PCCW wi-fi network is widely available. Complimentary wi-fi internet access provided by Apple is available throughout Hong Kong International Airport. There are also 56 free fixed internet terminals at 28 locations in the airside Departures Level of Terminal 1 and a further 6 fixed terminals, airside, at the Departures Level of North Satellite Concourse. The airport also has 256 free charging points at 71 locations either at seating areas or adjacent to public phones from Level 4 to 7 of Terminal 1 and Level 5 of North Satellite Concourse. Many large shopping malls have either free Internet terminals/free wi-fi hotspots or both including Times Square and Windsor House in Causeway Bay, IFC Mall in Central, Peak Galleria, Harbour City and The One in Tsim Sha Tsui, Grand Century Place in Mongkok, Harbour Centre in Wanchai, World Trade Centre in Causeway Bay, New Town Plaza in Sha Tin, East Point City at Tseung Kwan O, Metroplaza at Kwai Chung and Citygate Outlets, Tung Chung (30 mins PCCW free wi-fi). Some Uncle Russ Coffee bars including the ones at Central Ferry Pier 6 (for Mui Wo/Peng Chau), Central Pier 3 (for Discovery Bay) and Star Ferry Pier Tsim Sha Tsui have one or more Internet terminals for customer use. Mix juice bars have free internet access. Ocean Park - free park-wide unlimited high speed Wi-Fi access for visitors from March 2016. The Peak Galleria - unlimited free wi-fi access. NWFF (New World First Ferry) have made 20 minutes free wi-fi with Y5Zone available at Central Ferry Piers 5 (for ferries to Cheung Chau) and at Cheung Chau Ferry Pier. Ngong Ping 360 cable car terminals at Tung Chung and Ngong Ping and throughout Ngong Ping Village. An increasing number of hotels provide complimentary in-room wireless internet access for guests. 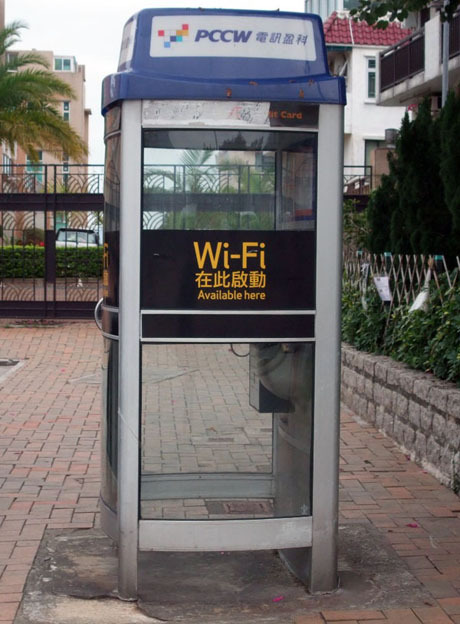 CSL / PCCW has over 8000 wi-fi hotspots including phone booths from which a wireless signal is usually available within 100-metres radius.